Click on any image below to view videos on a variety of pond water quality issues. The Future of Septic Systems On Cape Cod - A presentation by George Heufelder of alternative septic systems now being tested at the Cape Cod MASSTC facilities. Kyle Hinkle, Executive Director, Brewster Chamber of Commerce interviews BPC Board members Tom Vautin (R) and Konrad Schultz (L) who describe the group's mission. Featuring Robert Finch, Edward R. Murrow award winning nature writer and Paul Gasek, Emmy award winning documentary filmmaker. Sue Phelan, Founder and Director of Green Cape describes alternatives to pesticides and fertilizers. The planting of a bio-swale (rain garden) on Blueberry Pond. Septics 101 - Learn about various types of on-site septic systems. Be sure to check Title V regulations in MA for specific local requirements. Using Nature To Protect Nature at Blueberry Pond. 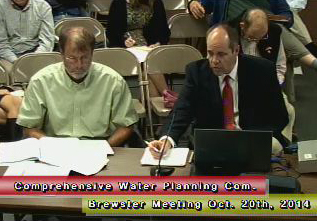 A 4 minute video about the building of a storm water remediation project in Brewster. Susan Lindquist, host of This Place Matters, interviews Tom Vautin, President and Gwen Pelletier, Treasurer, Clerk of the Brewster Ponds Coalition about its mission. 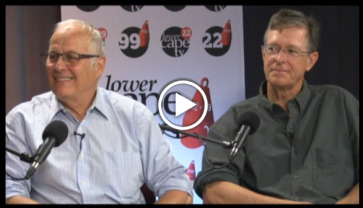 Susan Lindquist, host of This Place Matters, interviews Brewster Conservation Trust President, Hal Minis (L) and Brewster Ponds Coalition Board member, Konrad Schultz about Brewster Conservation Day and the importance of conservation. Tom Cambareri, Water Resources Program Manager for the Cape Cod Commission, talks about the state of our ponds at First Annual Meeting of Brewster Ponds Coalition. A fascinating look at the history of pond management in Brewster by Steve Hurley, Southeast District Manager for the MA Division of Fisheries and Wildlife. Barbara Conolly, MA Certified Landscape Professional and owner of Gardens by Barbara Conolly, shows ways to create sustainable gardens and landscapes. Mill Ponds Remediation Recommendations - presentation before the Brewster Comprehensive Water Planning Committee on October 20, 2014.